The Write to Read’s “Library Response Team” (the LRT’s, a nick name that has been given to the Team) consists of ladies who all have various degrees and experience working in schools, communities and university Libraries. Thousands of gently used books are donated to Write to Read from private collections, book sales, estate sales, etc. Once the donated books are sorted, processed, boxed and shipped to the designated first nation library, the Team goes into the community to set-up the library and train a number of first nation’s members of the community on how to run their Library once that is done we leave. The Team has completed 13 libraries, and there are approximately 13 to be completed in the future. We are always preparing the donated books for the next library. Our goal is to encourage everyone, no matter what age, to learn to read. We are dedicated to the Write to Read First Nation Literacy Project. 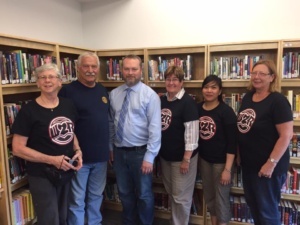 This photograph was recently taken at QUATSINO it is with the Lt.Governor Judith Guichon (3rd from left) next to her is Chief James Nelson. 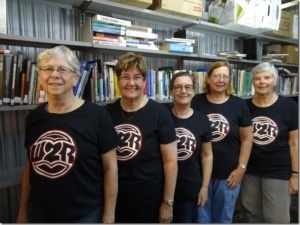 The LRT (Library Response Team) are an essential component of the W2r Project. They are a group of professional librarians who have donated endless hours of their time, skills and effort to gather and catalog books in the unheated storage locker in South Surrey where Write to Read keeps its mammoth collection of donated books. The LRT team makes sure that all books are properly catalogued and personally delivered to all libraries in advance of Grand Openings.